There’s nothing like a killer chord progression - but if you don’t have a music theory background, you might feel a bit lost when it comes to making one. 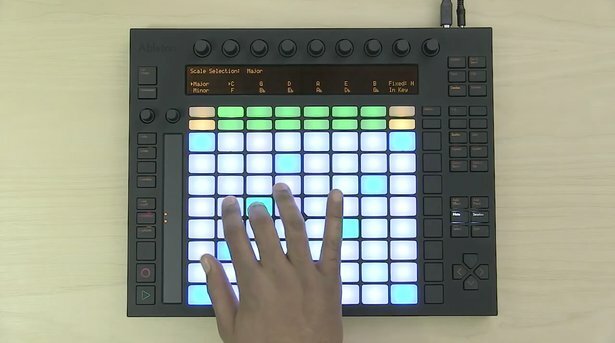 In this post, we’ll look at a few ways to make catchy chords and progressions in Live, including some simple theory education, free Racks to help you, and a look at Push’s scale mode. If you’re looking for another way to play through some chords, there are a few MIDI Effects Racks available to get you on your way. For a series of tweakable chord progressions for each key, try 8bitBandit’s Holy Scale. AudioBombs’ Deep House Chords rack includes a set of switchable chords best suited to Deep House music. Finally, Certified Trainer Yeuda Ben-Atar aka SideBrain has a set of racks for generating minor and major chords, with control for each harmonic added. Another great technique for getting the most out of chords is to invert them - essentially, take an existing chord that you’ve played, then invert the note order from lowest to highest. For more on the theory behind inverted chords, and to hear some examples, see this article in AskAudio Magazine. As of Live 9, you can also invert MIDI with the click of a button in a Clip - learn more about MIDI Clip editing tools. Christopher Willits looks at “harmonic triangles” with Push. Cats and Beats demonstrates basic chord progressions with Push. Hopefully, by now you’ve got some inspiration to make chords of your own. If you’ve got some special chord Racks or sound to share with us, don’t hesitate to get in touch on Facebook, Twitter, or Google+ - and don’t forget to use #MadeWithLive and #MadeWithPush. More chord theory features, tutorials and downloads.